NETWORK FINALS: There were no adjustments from Wednesday’s preliminary ratings. CABLE HIGHLIGHTS: The series finale of FX’s THE AMERICANS rose 0.03 to 0.22. The season finale of Freeform’s FAMOUS IN LOVE dropped 0.03 to 0.08. NBC Sports Net’s STANLEY CUP FINALS Game 2 led Wednesday cable at 1.32. On VH1, the season premiere of BLACK INK CREW was at 0.58. Bravo’s REAL HOUSEWIVES OF NYC rose 0.09 to 0.52. On HGTV, HOUSE HUNTERS INTL gained 0.08 to 0.33, HOUSE HUNTERS was up 0.09 to 0.33, and BROTHER VS BROTHER returned at 0.30, with the late-night BOISE BOYS up 0.05 to 0.26. On ID, MURDER CHOSE ME climbed 0.09 to 0.32, and SEE NO EVIL was steady at 0.25. On TLC, MY 600-LB LIFE gained 0.04 to 0.30, and SKIN TIGHT was up 0.05 to 0.20. MSNBC’s RACHEL MADDOW SHOW and Fox News’s HANNITY tied at 0.29 in the 18-49 demo, with MADDOW at 0.47/2.7M in 24-54 and Total Viewers, and HANNITY at 0.54/3.1M, with CNN’s ANDERSON COOPER 360 at 0.21/0.30/1M. The timeslot season premiere of OWN’s QUEEN SUGAR was at 0.29, down 0.25 from the parallel night in 2017, and down 0.11 from Tuesday night. 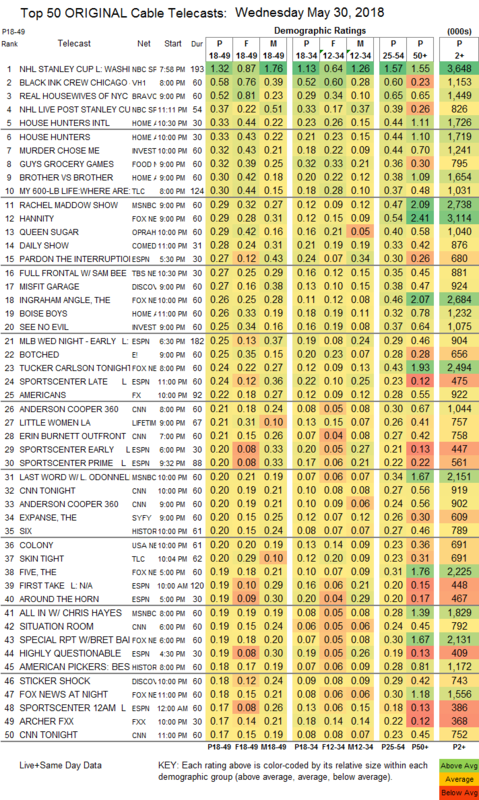 Comedy Central’s THE DAILY SHOW had an atypical Top 14 slot at 0.28. What became a controversial episode of TBS’s FULL FRONTAL dipped 0.04 to 0.27. On Discovery, MISFIT GARAGE held at 0.27, and STICKER SHOCK was up 0.04 to 0.18. E!’s BOTCHED ticked up to 0.25. Lifetime’s LITTLE WOMEN edged up 0.02 to 0.21. Syfy’s THE EXPANSE (rescued from cancellation by Amazon) gained 0.03 to 0.20. The timeslot season premiere of History’s SIX was at 0.20, down 0.04 from Monday’s episode. USA’s COLONY climbed 0.03 to 0.20. 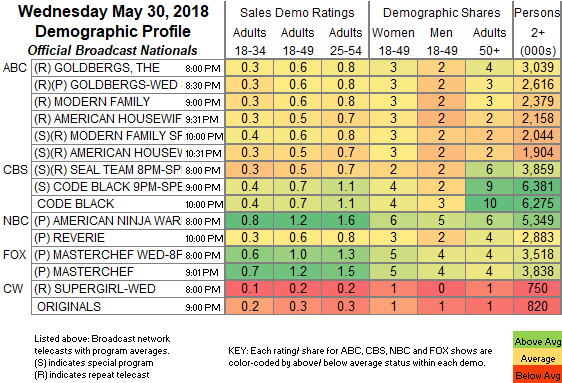 FXX’s ARCHER was up 0.02 to 0.17. IFC’s BROCKMIRE had a 0.05 leap to 0.11. HBO’s BEING SERENA ticked down to 0.06. POP’s HOLLYWOOD DARLINGS ticked up to 0.04. Sundance’s THE SPLIT fell 0.01 to 0.01/86K.